PARK LIMITED MUZIK is back. We bring you 5 tracks of techno madness all the way from UK. 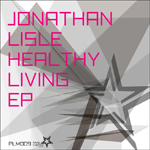 JONATHAN LISLE is an international DJ (and now producer) based in London. His reputation grew as one of the resident's at John Digweed's legendary Bedrock parties. As a result of that ever-increasing reputation, he released a groundbreaking DJ mix CD on Bedrock (Original Series 2) in 2005. While he developed his name as a progressive breaks DJ, he has since moved away from the progressive sound and delved into a more techno based style. As a result of that progression (pardon the pun), this E.P. was born. These are collection of tracks that pay homage to his version of Techno. Every tune fits a big and dark room with all of the clicks, clangs, pops, bleeps and blips you’d expect. Highlights of this E.P. include the Dave Seaman-championed “TELEPATHINE(DRUM MIX)”. “HEALTHY LIVING” also includes remix by PARK LIMITED MUZIK head honcho, DJ 19. He rarely remixes for his own labels, but Jonathan specifically asked him to remix to this release for PARK LIMITED MUZIK. While still dark and trippy, DJ 19’s remix adds an extra melody that has more focus on that aspect than the darker elements of the track. PARK LIMITED MUZIK is back. We bring you 5 tracks of techno madness all the way from UK, done by JONATHAN LISLE who is an international DJ (and now producer) based in London. His reputation grew as one of the resident's at John Digweed's legendary Bedrock parties. While he developed his name as a progressive breaks DJ, he has since moved away from the progressive sound and delved into a more techno based style. As a result of that progression (pardon the pun), this E.P. was born. These are collection of tracks that pay homage to his version of Techno. Every tune fits a big and dark room with all of the clicks, clangs, pops, bleeps and blips you’d expect. Highlights of this E.P. include the Dave Seaman-championed “TELEPATHINE(DRUM MIX)” and DJ 19 remix of “HEALTHY LIVING”. Out on Oct 27th. This is the first installment of a remix collection, which was originally taken from their debut album “This Is A Journey Into Sound”. VALID EVIDENCE(DJ 19 & YU-TA) is pure sea-soaked, sun-stricken, cocktail-laden Balearic grooves. Their tracks have no doubt proven to be the perfect soundtrack to thousands of Ibizian sunrises and chill out sessions. This duo is already known for their remix of the seminal SHAKATAK’s “Night Birds”. De-spite their Balearic influences, this release delivers with remixes that is set to stir up any sophisticated dancefloor. There’s very little that needs to be explained about NICK HOLDER. He’s a house legend in Canada and was one of that country’s earliest exporters of house music. From deep, to disco, to just straight up funky or jazzy, Mr. Holder has released some of the finest house music there is over the course of the past two decades. VIRUS J a.k.a. JUSTIN C has stepped up to the plate to deliver a fantastic remix. He is definitely one of the most active Lithuanian DJ/producers out there. His interpretation sees him attaching his trademark trancey/electro elements with the original track’s Japanese vocals. Finally, the last remixer is one very hot talent. This is first appearance of BLUE SATELLITES aka PHILIP SCHWAN. He’s the American answer to France’s JUSTICE and brings an ED BANGER vibe to his re-work. If you like these remixes, don’t forget to check out original tracks! Their worthy in their own right!